I hope you all enjoyed tonight’s poem–I thought it was appropriate for the time of year! The scary artwork is by Midorieyes on deviantart. If you want to see more of her work, come check out her page! If you like fantasy/adventure books, there’s a sale going on on my publishing website right now. Get 15% off paperback and hardcover versions of The Prince of Prophecy Vol. I: Destined from now until November 1st! Hurry in and get your copy while these spooky-awesome deals are still going on! For new fairy tale updates every Wednesday and Saturday, follow this blog! Your book’s written and nearly ready to publish, so what now? Many authors choose to have a book launch party to celebrate the happy occasion and let people know that their book is available for purchase. However, for indie authors, book launch parties can be quite costly. Many independent authors decide to skip their book launch parties all together because of the sheer cost it. This is a mistake, mainly because book launch parties are a great promotional tool for any author. I’m here to tell you that anyone can have an amazing and unforgettable book launch party without breaking the bank. With a little time and effort, you can throw an awesome party that your guests will be talking about for months to come—and if they remember the party, they’ll remember your book. The first step to throwing a book launch party is choosing a venue—you should probably decide this a few months prior to the party in order to better prepare. Community club houses, indie bookstores, and libraries, are great places to host your party if you plan on inviting the general public to your book launch. However, if you only intend on extending invitations to family, friends, and friends of friends, I recommend saving yourself a little extra cash and hosting it at your house/family member’s house/friend’s house. A house is ideal if your guest list is between 20-50 people—this is the route I took when I hosted my first book launch party for The Prince of Prophecy Vol. I: Destined. You’ve got two choices here: 1.) strictly appetizers, or 2.) dinner. I’ve learned from personal experience that although offering dinner is a great way to get people to your party, it takes the attention away from you and your book. Once everyone’s sat down for dinner, you’ve lost your audience to food. It’s sad, but true. Full bellies make people sleepy, and when people are sleepy they leave early. Save yourself some grief and stick to appetizers (preferably relating to your book) to keep your guests minds on what’s important: your newly published novel. If, however, you do decide to serve dinner at your party and you’ve got some extra money and not a lot of time, hiring a food truck is a great way to keep your guests fed and is often cheaper than getting your party catered. If, on the other hand, you’ve got a lot of time and want to save some money, make dinner yourself! Make dishes that can easily and inexpensively be made in bulk and, if you can, have the food you serve relate to your book (for instance, my book, The Prince of Prophecy Vol. I: Destined, takes place in Germany so I served German food at my launch party). If most of your invitees are 21 and over, novelty cocktails are a fun way to engage your guests. For my book launch party I had three novelty cocktails: Wilhelm’s Poisoned Watermelon (midori sour), Finn’s Bravery in a Cup (rum and vanilla coke), and Isole’s Kiss of Ice (non-alcoholic mint julep). The specialty drinks were a huge hit, and got people asking about the characters they were named after. I know it might be tempting to go out and buy lots of decorations to impress your guests with; however, the costs of snazzy decorations adds up quickly. To save your money for the things that matter (like buying books and merchandise to sell/give away at your party), gather some creative friends and make the decorations yourselves. I, for instance, employed one of my artist friends to draw a few of my characters. I printed those characters out and stuck them on the gift bags, the center pieces for the tables, and the labels for the appetizers. Since my book pays homage to The Snow Queen by Hans Christian Andersen, I also cut out some snowflakes and strung them up beside a poster of my book (which I had printed at Staples). Bottom line: be creative and employ all free resources at your disposal—you probably have more of those than you realize. Everyone likes free stuff! Handing out gift bags with things relating to your book is a great way promote your new novel. For my book launch party I bought laminated bookmarks, customized pens (99 Cent store pens which I wrapped with stickers of my book’s cover), and German candy to put in the gift bags. If you’ve got a bit more money on hand, buy customizable tote bags in bulk and put your book cover on them or your publishing logo (if you have one). Sticking your business card in the gift bags is another great way for your guests to remember you and your book. When you order business cards from places like vistaprint.com they offer the option of putting tipping percentages and other useful charts on the back of your business card. If you do this, the chances of your guests keeping your business card are much higher. Make sure most of the favors you hand out are useful things that your guests can utilize every day such as: pens, bookmarks, tote bags, USB drives, notepads, can coolers, bottle openers, letter openers, keychain flashlights, mouse pads, shirts, etc. Keeping your guests interested and engaged is a major part of orchestrating a memorable book launch party. Have games ready for your guests to play, and encourage participation with prizes like merchandise, candy, or even the chance to win a free copy of your book. At my book launch party we played a couple of games. The first was a fairy tale themed “Who Am I?” game (my book has to do with fairy tales, so it made sense) in which I wrote a bunch of fairy tale names on sticky labels and stuck them on my guests’ backs. My guests then had to ask each other yes or no questions in regards to which fairy tale character they were. The first person to correctly guess who they were received a German chocolate bar. 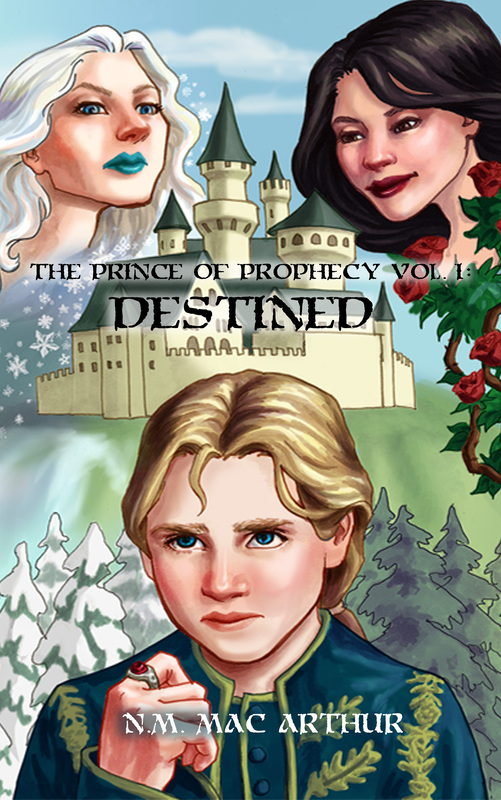 I also set up a fairy tale trivia game, in which the winner won a German chocolate bar, a key chain of my main character (Destan), and a free paperback copy of the second book in the series (The Prince of Prophecy Vol. II: Cursed, launching this December). Finally, I raffled off a copy of Destined—if you’re going to do this, I recommend drawing a winner before your guests arrive. It really doesn’t matter what games or activities you have at your party, just so long as you make it fun and engaging for your guests. The more fun they have, the more interested they’ll be in purchasing your book! 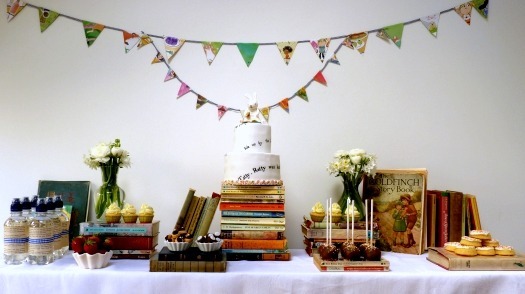 What is the most important thing to have at your book launch party? Your books, of course! Order as many copies as you can to sell at your launch party—trust me, if they’re available to your guests, your guests will buy them. If you don’t have a lot of money to purchase physical copies of your books, you can also set up a laptop pay station, where your launch party attendees can purchase your book online. As an added incentive to buy your book at the launch party, give your guests a discounted price on your novel and offer to sign it for them. I cannot stress enough how important it is to have at least some physical copies of your book at the launch party. Never assume someone is going to buy your book at a later date, even if they said they will—that’s like counting your chickens before they hatch. If you’re able, buy enough copies for everyone at the party—your guests are more likely to buy the book if it’s physically available to them. Buying your own books will probably be one of the more expensive parts of your party no matter what you decide to do; however, they are crucial to your party’s success. Cut back where you can in the other areas mentioned above so you can have physical copies of your books on hand—I guarantee you won’t regret it. Well, there you have it, a basic overview of a book launch party on the cheap. Start your planning in advance—the sooner you do, the less stress you’ll have to deal with when you get closer to the big day. Happy planning! If you have any more tips, questions, or comments about book launch parties on a budget, please leave them in the comments! For new writer tidbits and fairy tale updates every Wednesday and Saturday, follow this blog! Little Toomai came in with a joyous tunk-a-tunk at the end of each verse, till he felt sleepy and stretched himself on the fodder at Kala Nag’s side. At last the elephants began to lie down one after another as is their custom, till only Kala Nag at the right of the line was left standing up; and he rocked slowly from side to side, his ears put forward to listen to the night wind as it blew very slowly across the hills. The air was full of all the night noises that, taken together, make one big silence– the click of one bamboo stem against the other, the rustle of something alive in the undergrowth, the scratch and squawk of a half-waked bird (birds are awake in the night much more often than we imagine), and the fall of water ever so far away. Little Toomai slept for some time, and when he waked it was brilliant moonlight, and Kala Nag was still standing up with his ears cocked. Little Toomai turned, rustling in the fodder, and watched the curve of his big back against half the stars in heaven, and while he watched he heard, so far away that it sounded no more than a pinhole of noise pricked through the stillness, the “hoot-toot” of a wild elephant. Two hours later, as Petersen Sahib was eating early breakfast, his elephants, who had been double chained that night, began to trumpet, and Pudmini, mired to the shoulders, with Kala Nag, very footsore, shambled into the camp. 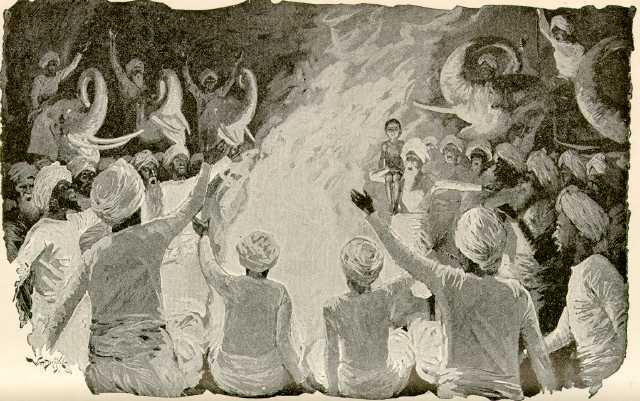 Little Toomai’s face was gray and pinched, and his hair was full of leaves and drenched with dew, but he tried to salute Petersen Sahib, and cried faintly: “The dance–the elephant dance! I have seen it, and–I die!” As Kala Nag sat down, he slid off his neck in a dead faint. I hope you enjoyed today’s story! For new fairy tale updates every Wednesday and Saturday, follow this blog! There was once a King who had a son who asked in marriage the daughter of a mighty King; she was called Maid Maleen, and was very beautiful. As her father wished to give her to another, the prince was rejected; but as they both loved each other with all their hearts, they would not give each other up, and Maid Maleen said to her father, “I can and will take no other for my husband.” Then the King flew into a passion, and ordered a dark tower to be built, into which no ray of sunlight or moonlight should enter. When it was finished, he said, “Therein shalt thou be imprisoned for seven years, and then I will come and see if thy perverse spirit is broken.” Meat and drink for the seven years were carried into the tower, and then she and her waiting-woman were led into it and walled up, and thus cut off from the sky and from the earth. There they sat in the darkness, and knew not when day or night began. The King’s son often went round and round the tower, and called their names, but no sound from without pierced through the thick walls. What else could they do but lament and complain? Meanwhile the time passed, and by the diminution of the food and drink they knew that the seven years were coming to an end. They thought the moment of their deliverance was come; but no stroke of the hammer was heard, no stone fell out of the wall, and it seemed to Maid Maleen that her father had forgotten her. 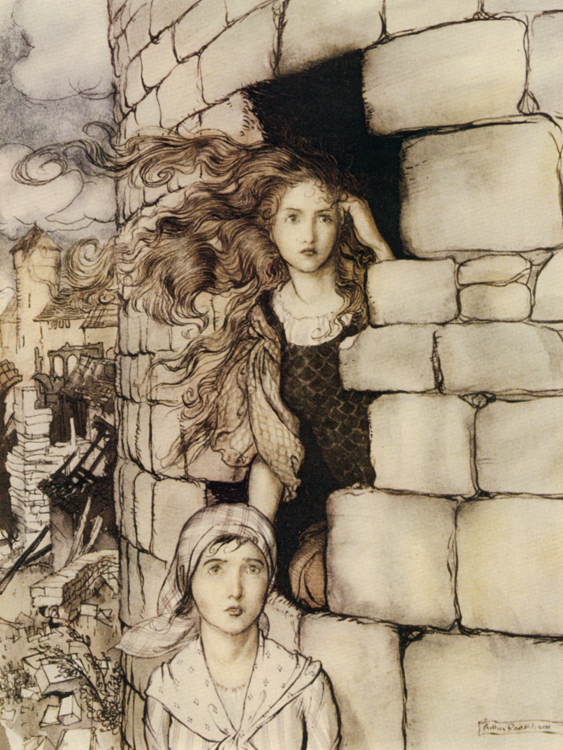 As they only had food for a short time longer, and saw a miserable death awaiting them, Maid Maleen said, “We must try our last chance, and see if we can break through the wall.” She took the bread-knife, and picked and bored at the mortar of a stone, and when she was tired, the waiting-maid took her turn. With great labour they succeeded in getting out one stone, and then a second, and a third, and when three days were over the first ray of light fell on their darkness, and at last the opening was so large that they could look out. The sky was blue, and a fresh breeze played on their faces; but how melancholy everything looked all around! Her father’s castle lay in ruins, the town and the villages were, so far as could be seen, destroyed by fire, the fields far and wide laid to waste, and no human being was visible. When the opening in the wall was large enough for them to slip through, the waiting-maid sprang down first, and then Maid Maleen followed. But where were they to go? The enemy had ravaged the whole kingdom, driven away the King, and slain all the inhabitants. They wandered forth to seek another country, but nowhere did they find a shelter, or a human being to give them a mouthful of bread, and their need was so great that they were forced to appease their hunger with nettles. When, after long journeying, they came into another country, they tried to get work everywhere; but wherever they knocked they were turned away, and no one would have pity on them. At last they arrived in a large city and went to the royal palace. There also they were ordered to go away, but at last the cook said that they might stay in the kitchen and be scullions. “What art thou saying there?” asked he. “Ah,” she answered, “I was only thinking of Maid Maleen.” Then he took out a precious chain, put it round her neck, and fastened the clasp. Thereupon they entered the church, and the priest joined their hands together before the altar, and married them. He led her home, but she did not speak a single word the whole way. When they got back to the royal palace, she hurried into the bride’s chamber, put off the magnificent clothes and the jewels, dressed herself in her gray gown, and kept nothing but the jewel on her neck, which she had received from the bridegroom. “That will break thy neck for thee!” cried the bride, and flew into a terrible passion, but she hastened back into the room, and said, “I know now what I said to the church-door,” and she repeated the words. “But where hast thou the jewel which I gave thee at the church-door?” “What jewel?” she answered; “thou didst not give me any jewel.” “I myself put it round thy neck, and I myself fastened it; if thou dost not know that, thou art not the true bride.” He drew the veil from her face, and when he saw her immeasurable ugliness, he sprang back terrified, and said, “How comest thou here? Who art thou?” “I am thy betrothed bride, but because I feared lest the people should mock me when they saw me out of doors, I commanded the scullery-maid to dress herself in my clothes, and to go to church instead of me.” “Where is the girl?” said he; “I want to see her, go and bring her here.” She went out and told the servants that the scullery-maid was an impostor, and that they must take her out into the court-yard and strike off her head. The servants laid hold of Maid Maleen and wanted to drag her out, but she screamed so loudly for help, that the King’s son heard her voice, hurried out of his chamber and ordered them to set the maiden free instantly. Lights were brought, and then he saw on her neck the gold chain which he had given her at the church-door. “Thou art the true bride, said he, “who went with me to the church; come with me now to my room.” When they were both alone, he said, “On the way to church thou didst name Maid Maleen, who was my betrothed bride; if I could believe it possible, I should think she was standing before me thou art like her in every respect.” She answered, “I am Maid Maleen, who for thy sake was imprisoned seven years in the darkness, who suffered hunger and thirst, and has lived so long in want and poverty. To-day, however, the sun is shining on me once more. I was married to thee in the church, and I am thy lawful wife.” Then they kissed each other, and were happy all the days of their lives. The false bride was rewarded for what she had done by having her head cut off. 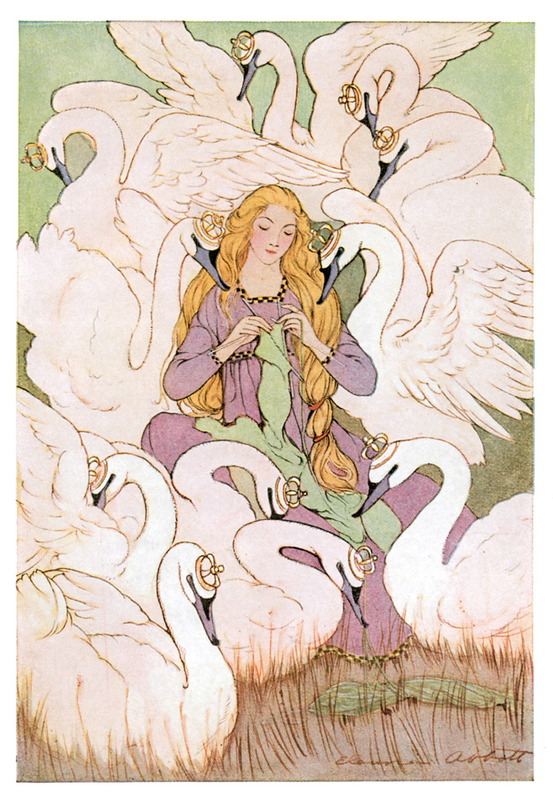 But she did not harm the Princes as much as she meant to, for they turned into eleven magnificent white swans. With a weird cry, they flew out of the palace window, across the park into the woods. It was so early in the morning that their sister, Elisa, was still asleep when they flew over the peasant hut where she was staying. They hovered over the roofs, craning and twisting their long necks and flapping their wings, but nobody saw them or heard them. They were forced to fly on, high up near the clouds and far away into the wide world. They came down in a vast, dark forest that stretched down to the shores of the sea. Poor little Elisa stayed in the peasant hut, and played b 00 with a green leaf, for she had no other toy. She made a little hole in the leaf and looked through it at the sun. Through it she seemed to see her brothers’ bright eyes, and whenever the warm sunlight touched her cheek it reminded her of all their kisses. One day passed like all the others. When the wind stirred the hedge roses outside the hut, it whispered to them, could be prettier than you?” But the roses shook their heads and answered, “Elisa!” And on Sunday, when the old woman sat in the doorway reading the psalms, the wind fluttered through the pages and said to the book, “Who could be more saintly than you?” “Elisa,” the book testified. What it and the roses said was perfectly true. “Squat on Elisa’s head, when she bathes, so that she will become as torpid as you are.” To the second she said, “Squat on her forehead, so that she will become as ugly as you are, and her father won’t recognize her.” And to the third, she whispered, “Lie against her heart, so that she will be cursed and tormented by evil desires. When the evil Queen realized this, she rubbed Elisa with walnut stain that turned her dark brown, smeared her beautiful face with a vile ointment, and tousled her lovely hair. No one could have recognized the beautiful Elisa, and when her father saw her he was shocked. He said that this could not be his daughter. No one knew her except the watchdog and the swallows, and they were humble creatures who had nothing to say. Poor Elisa cried and thought of her eleven brothers, who were all away. Heavy-hearted, she stole away from the palace and wandered all day long over fields and marshes, till she came to the vast forest. She had no idea where to turn. All she felt was her sorrow and her longing to be with her brothers. Like herseIf, they must have been driven out into the world, and she set her heart upon finding them. She had been in the forest only a little while when night came on, and as she had strayed from any sign of a path she said her prayers and lay down on the soft moss, with her head pillowed against a stump. All was quiet, the air was so mild, and hundreds of fireflies glittered like a green fire in the grass and moss. When she lightly brushed against a single branch, the shining insects showered about her like falling stars. She dreamed of her brothers all night long. They were children again, playing together, writing with their diamond pencils on their golden slates, and looking at her wonderful picture book that had cost half a kingdom. But they no longer scribbled sums and exercises as they used to do. No, they set down their bold deeds and all that they had seen or heard. Everything in the picture book came alive. The birds sang, and the people strolled out of the book to talk with Elisa and her brothers, but whenever she turned a page they immediately jumped back into place, to keep the pictures in order. When she awoke, the sun was already high. She could not see it plainly, for the tall trees spread their tangled branches above her, but the rays played above like a shimmering golden gauze. There was a delightful fragrance of green foliage, and the birds came near enough to have perched on her shoulder. She heard the water splashing from many large springs, which all flowed into a pool with the most beautiful sandy bottom. Although it was hemmed in by a wall of thick bushes, there was one place where the deer had made a path wide enough for Elisa to reach the water. The pool was so clear that, if the wind had not stirred the limbs and bushes, she might have supposed they were painted on the bottom of the pool. For each leaf was clearly reflected, whether the sun shone upon it or whether it grew in the shade. When Elisa saw her own face she was horrified to find it so brown and ugly. But as soon as she wet her slender hand, and rubbed her brow and her eyes, her fair skin showed again. Then she laid aside her clothes and plunged into the fresh water. In all the world there was no King’s daughter as lovely as Elisa. When she had dressed herself and plaited her long hair, she went to the sparkling spring and drank from the hollow of her hand. She wandered deeper into the woods without knowing whither she went. She thought of her brothers, and she thought of the good Lord, who she knew would not forsake her. He lets the wild crab apples grow to feed the hungry, and he led her footsteps to a tree with its branches bent down by the weight of their fruit. Here she had her lunch. After she put props under the heavy limbs, she went on into the depths of the forest. It was so quiet that she heard her own footsteps and every dry leaf that rustled underfoot. Not a bird was in sight, not a ray of the sun could get through the big heavy branches, and the tall trees grew so close together that when she looked straight ahead it seemed as if a solid fence of lofty palings imprisoned her. She had never known such solitude. The night came on, pitch black. Not one firefly glittered among the leaves as she despondently lay down to sleep. Then it seemed to her that the branches parted overhead and the Lord looked kindly down upon her, and little angels peeped out from above His head and behind Him. When she awoke the next morning she did not know whether she had dreamed this, or whether it had really happened. A few steps farther on she met an old woman who had a basket of berries and gave some of them to her. Elisa asked if she had seen eleven Princes riding through the forest. She led Elisa a little way to the top of a hill which sloped down to a winding river. The trees on either bank stretched their long leafy branches toward each other, and where the stream was too wide for them to grow across it they had torn their roots from the earth and leaned out over the water until their branches met. Elisa told the old woman good-by, and followed the river down to where it flowed into the great open sea. Before the young girl lay the whole beautiful sea, but not a sail nor a single boat was in sight. How could she go on? She looked at the countless pebbles on the beach, and saw how round the water had worn them. Glass, iron ore, stones, all that had been washed up, had been shaped by the water that was so much softer than even her tender hand. Among the wet seaweed she found eleven white swan feathers, which she collected in a sheaf. There were still drops of water on them, but whether these were spray or tears no one could say. It was very lonely along the shore but she did not mind, for the sea was constantly changing. Indeed it showed more changes in a few hours than an inland lake does in a whole year. When the sky was black with threatening clouds, it was as if the sea seemed to say, ‘I can look threatening too.” Then the wind would blow and the waves would raise their white crests. But when the wind died down and the clouds were red, the sea would look like a rose petal. Sometimes it showed white, and sometimes green, but however calm it might seem there was always a gentle lapping along the shore, where the waters rose and fell like the chest of a child asleep. Just at sunset, Elisa saw eleven white swans, with golden crowns on their heads, fly toward the shore. As they flew, one behind another, they looked like a white ribbon floating in the air. Elisa climbed up and hid behind a bush on the steep bank. The swans came down near her and flapped their magnificent white wings. “We brothers,” said the eldest, “are forced to fly about disguised as wild swans as long as the sun is in the heavens, but when it goes down we take back our human form. So at sunset we must always look about us for some firm foothold, because if ever we were flying among the clouds at sunset we would be dashed down to the earth. “We do not live on this coast. Beyond the sea there is another land as fair as this, but it lies far away and we must cross the vast ocean to reach it. Along our course there is not one island where we can pass the night, except one little rock that rises from the middle of the sea. It is barely big enough to hold us, however close together we stand, and if there is a rough sea the waves wash over us. But still we thank God for it. “How shall I set you free?” their sister asked, and they talked on for most of the night, sparing only a few hours for sleep. In the morning Elisa was awakened by the rustling of swans’ wings overhead. Her brothers, once more enchanted, wheeled above her in great circles until they were out of sight. One of them, her youngest brother, stayed with her and rested his head on her breast while she stroked his wings. They spent the whole day together, and toward evening the others returned. As soon as the sun went down they resumed their own shape. “Tomorrow,” said one of her brothers, we must fly away, and we dare not return until a whole year has passed. But we cannot leave you like this. Have you courage enough to come with us? My arm is strong enough to carry you through the forest, so surely the wings of us all should be strong enough to bear you across the sea.” “Yes, take me with you,” said Elisa. All day they flew like arrows whipping through the air, yet, because they had their sister to carry, they flew more slowly than on their former journeys. Night was drawing near, and a storm was rising. In terror, Elisa watched the sinking sun, for the lonely rock was nowhere in sight. It seemed to her that the swans beat their wings in the air more desperately. Alas it was because of her that they could not fly fast enough. So soon as the sun went down they would turn into men, and all of them would pitch down into the sea and drown. She prayed to God from the depths of her heart, but still no rock could be seen. Black clouds gathered and great gusts told of the storm to come. The threatening clouds came on as one tremendous wave that rolled down toward them like a mass of lead, and flash upon flash of lightning followed them. Then the sun touched the rim of the sea. Elisa’s heart beat madly as the swans shot down so fast that she thought they were falling, but they checked their downward swoop. Half of the sun was below the sea when she first saw the little rock below them. It looked no larger than the head of a seal jutting out of the water. The sun sank very fast. Now it was no bigger than a star, but her foot touched solid ground. Then the sun went out like the last spark on a piece of burning paper. She saw her brothers stand about her, arm in arm, and there was only just room enough for all of them. The waves beat upon the rock and washed over them in a shower of spray. The heavens were lit by constant flashes, and bolt upon bolt of thunder crashed. But the sister and brothers clasped each other’s hands and sang a psalm, which comforted them and gave them courage. When the sun rose higher, Elisa saw before her a mountainous land, half floating in the air. Its peaks were capped with sparkling ice, and in the middle rose a castle that was a mile long, with one bold colonnade perched upon another. Down below, palm trees swayed and brilliant flowers bloomed as big as mill wheels. She asked if this was the land for which they were bound, but the swans shook their heads. What she saw was the gorgeous and ever changing palace of Fata Morgana. No mortal being could venture to enter it. As Elisa stared at it, before her eyes the mountains, palms, and palace faded away, and in their place rose twenty splendid churches, all alike, with lofty towers and pointed windows. She thought she heard the organ peal, but it was the roll of the ocean she heard. When she came close to the churches they turned into a fleet of ships sailing beneath her, but when she looked down it was only a sea mist drifting over the water. Scene after scene shifted before her eyes until she saw at last the real country whither they went. Mountains rose before her beautifully blue, wooded with cedars, and studded with cities and palaces. Long before sunset she was sitting on a mountainside, in front of a large cave carpeted over with green creepers so delicate that they looked like embroidery. “We shall see what you’ll dream of here tonight,” her youngest brother said, as he showed her where she was to sleep. “I only wish I could dream how to set you free,” she said. She touched Elisa’s hand with nettles that burned like fire and awakened her. It was broad daylight, and close at hand where she had been sleeping grew a nettle like those of which she had dreamed. She thanked God upon her knees, and left the cave to begin her task. Elisa shook her head, for she did not dare to speak. Her brothers’ deliverance and their very lives depended upon it, and she hid her hands under her apron to keep the King from seeing how much she suffered. “Come with me,” he told her. “You cannot stay here. If you are as good as you are fair I shall clothe you in silk and velvet, set a golden crown upon your head, and give you my finest palace to live in.” Then he lifted her up on his horse. When she wept and wrung her hands, the King told her, “My only wish is to make you happy. Some day you will thank me for doing this.” Off through the mountains he spurred, holding her before him on his horse as his huntsmen galloped behind them. She was so dazzlingly beautiful in all this splendor that the whole court bowed even deeper than before. And the King chose her for his bride, although the archbishop shook his head and whispered that this lovely maid of the woods must be a witch, who had blinded their eyes and stolen the King’s heart. When Elisa saw these things that were so precious to her, a smile trembled on her lips, and the blood rushed back to her cheeks. The hope that she could free her brothers returned to her, and she kissed the King’s hand. He pressed her to his heart and commanded that all the church bells peal to announce their wedding. The beautiful mute girl from the forest was to be the country’s Queen. The archbishop whispered evil words in the King’s ear, but they did not reach his heart. The wedding was to take place. The archbishop himself had to place the crown on her head. Out of spite, he forced the tight circlet so low on her forehead that it hurt her. But a heavier band encircled her heart, and; the sorrow she felt for her brothers kept her from feeling any hurt of the flesh. Her lips were mute, for one single word would mean death to her brothers, but her eyes shone with love for the kind and handsome King who did his best to please her. Every day she grew fonder and fonder of him in her heart. Oh, if only she could confide in him, and tell him what grieved her. But mute she must remain, and finish her task in silence. 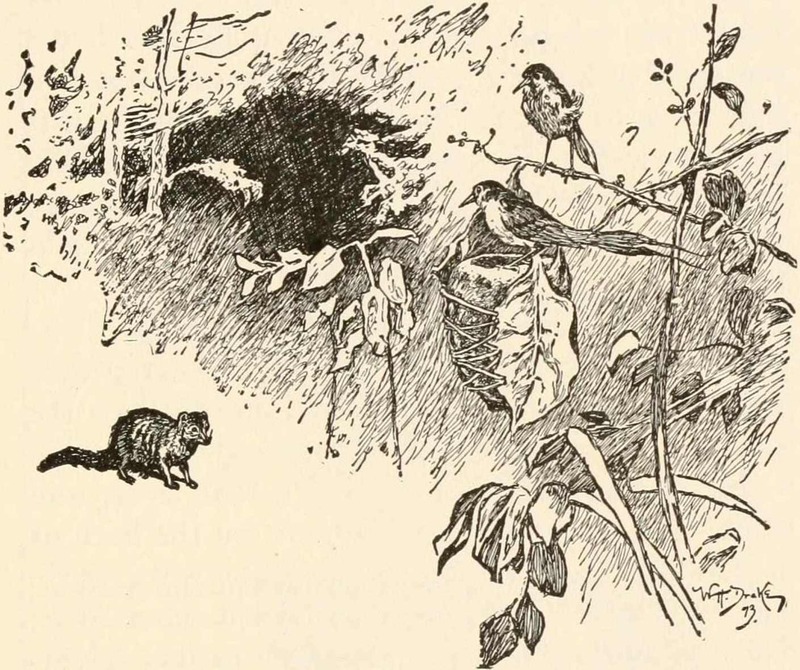 So at night she would steal away from his side into her little chamber which resembled the cave, and there she wove one shirt after another, but when she set to work on the seventh there was not enough flax left to finish it. In the confessional, he told the King what he had seen and what he feared. As the bitter words spewed from his mouth, the images of the saints shook their heads, as much as to say, He lies. Elisa is innocent.” The archbishop, however, had a different explanation for this. He said they were testifying against her, and shaking their heads at her wickedness. Two big tears rolled down the King’s cheeks as he went home with suspicion in his heart. That night he pretended to be asleep, but no restful sleep touched his eyes. He watched Elisa get out of bed. Every night he watched her get up and each time he followed her quietly and saw her disappear into her private little room. Day after day his frown deepened. Elisa saw it, and could not understand why this should be, but it made her anxious and added to the grief her heart already felt for her brothers. Her hot tears fell down upon her queenly robes of purple velvet. There they flashed like diamonds, and all who saw this splendor wished that they were Queen. Meanwhile she had almost completed her task. Only one shirt was lacking, but again she ran out of flax. Not a single nettle was left. Once more, for the last time, she must go to the churchyard and pluck a few more handfuls. She thought with fear of the lonely walk and the ghastly vampires, but her will was as strong as her faith in God. “Let the people judge her,” he said. And the people did judge her. They condemned her to die by fire. But toward evening she heard the rustle of a swan’s wings close to her window. It was her youngest brother who had found her at last. She sobbed for joy. Though she knew that this night was all too apt to be her last, the task was almost done and her brothers were near her. The archbishop came to stay with her during her last hours on earth, for this much he had promised the King. But she shook her head, and by her expression and gestures begged him to leave. This was the last night she had to finish her task, or it would all go for naught-all her pain, and her tears, and her sleepless nights. The archbishop went away, saying cruel things against her. But poor Elisa knew her own innocence, and she kept on with her task. The little mice ran about the floor, and brought nettles to her feet, trying to help her all they could. And a thrush perched near the bars of her window to sing the whole night through, as merrily as he could, so that she would keep up her courage. It was still in the early dawn, an hour before sunrise, when the eleven brothers reached the palace gates and demanded to see the King. This, they were told, was impossible. It was still night. The King was asleep and could not be disturbed. They begged and threatened so loudly that the guard turned out, and even the King came running to find what the trouble was. But at that instant the sun rose, and the eleven brothers vanished. Eleven swans were seen flying over the palace. “It is a sign from Heaven. She must be innocent,” many people whispered. But no one dared say it aloud. As the executioner seized her arm, she made haste to throw the eleven shirts over the swans, who instantly became eleven handsome Princes. But the youngest brother still had a swan’s wing in place of one arm, where a sleeve was missing from his shirt. Elisa had not quite been able to finish it. All the people who saw what had happened bowed down to her as they would before a saint. But the strain, the anguish, and the suffering had been too much for her to bear, and she fell into her brothers’ arms as if all life had gone out of her. “She is innocent indeed!” said her eldest brother, and he told them all that had happened. And while he spoke, the scent of a million roses filled the air, for every piece of wood that they had piled up to burn her had taken root and grown branches. There stood a great high hedge, covered with red and fragrant roses. At the very top a single pure white flower shone like a star. The King plucked it and put it on Elisa’s breast. And she awoke, with peace and happiness in her heart. 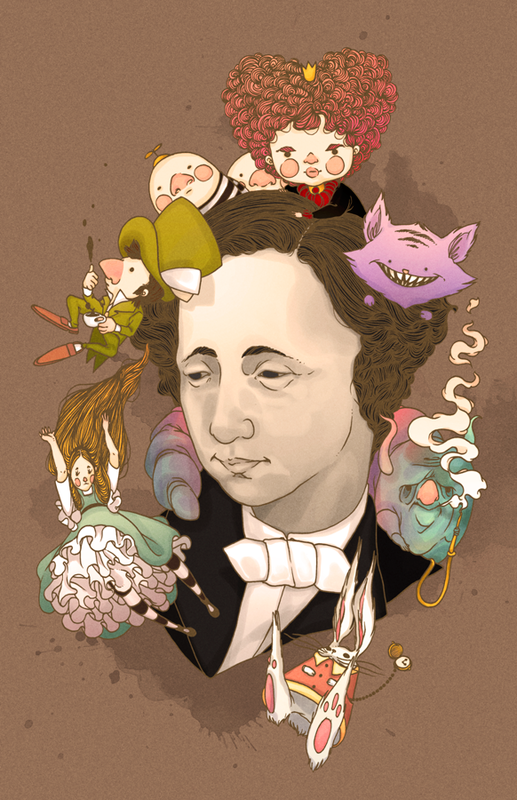 Another beautiful Story by Hans Christian Andersen. I hope you all enjoyed reading The Wild Swans as much as I did! For new fairy tale updates every Wednesday and Saturday, follow this blog! I really like this poem, and I hope you enjoyed it too! For new fairy tale/poem updates every Wednesday and Saturday, follow this blog! Rikki-tikki-tikki, the ivory-fanged, the hunter with eyeballs of flame! Hear! I will sing you the praise of the bottle-tailed Rikki, with eyeballs of Red! Once upon a time in a certain country there was great concern about a wild boar that was destroying the peasants’ fields, killing the cattle, and ripping people apart with its tusks. The king promised a large reward to anyone who could free the land from this plague, but the beast was so large and strong that no one dared to go near the woods where it lived. Finally the king proclaimed that whoever could capture or kill the wild boar should have his only daughter in marriage. Now in this country there lived two brothers, sons of a poor man. They declared that they dared to attempt the task. The older one, who was crafty and shrewd, did so out of pride. The younger one, who was innocent and simple, did so because of his kind heart. Thus the older one entered the woods from the west, and the younger one from the east. He thanked the dwarf, put the spear on his shoulder, and walked on fearlessly. Before long he saw the beast. It attacked him, but he held the spear toward it, and in its blind fury it ran into the spear with such force that its heart was slashed in two. 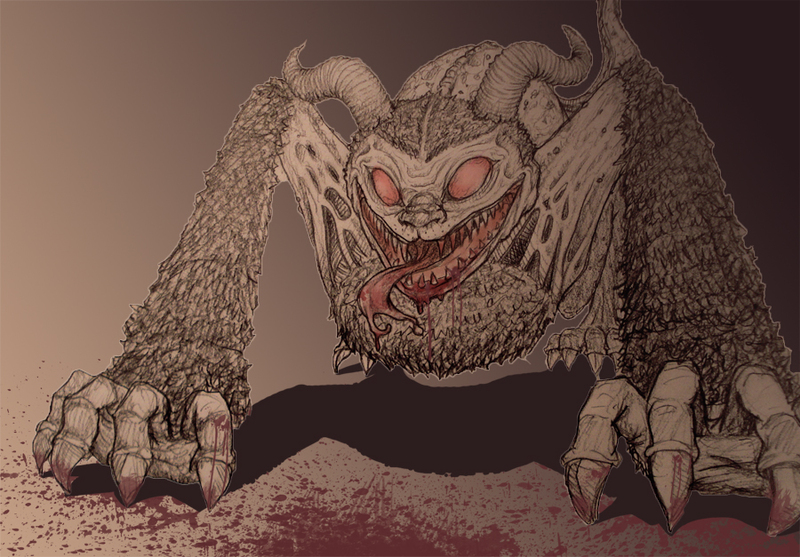 Then he put the monster on his back and turned towards home, intending to take it to the king. Emerging from the other side of the woods, he came to a house where people were making merry drinking wine and dancing. His older brother was there too. Thinking that the boar would not run away from him any time soon, he had decided to drink himself some real courage. When he saw his younger brother coming out of the woods with his booty, his envious and evil heart gave him no peace. The younger brother, suspecting no evil, went in and told him about the good dwarf who had given him the spear with which he had killed the boar. The older brother kept him there until evening, and then they set forth together. After dark they came to a bridge over a brook, and the older brother let the younger one go first. When the younger brother reached the middle above the water, the older one gave him such a blow from behind that he fell down dead. He buried him beneath the bridge, took the boar, and delivered it to the king, pretending that he had killed it. With this he received the king’s daughter in marriage. 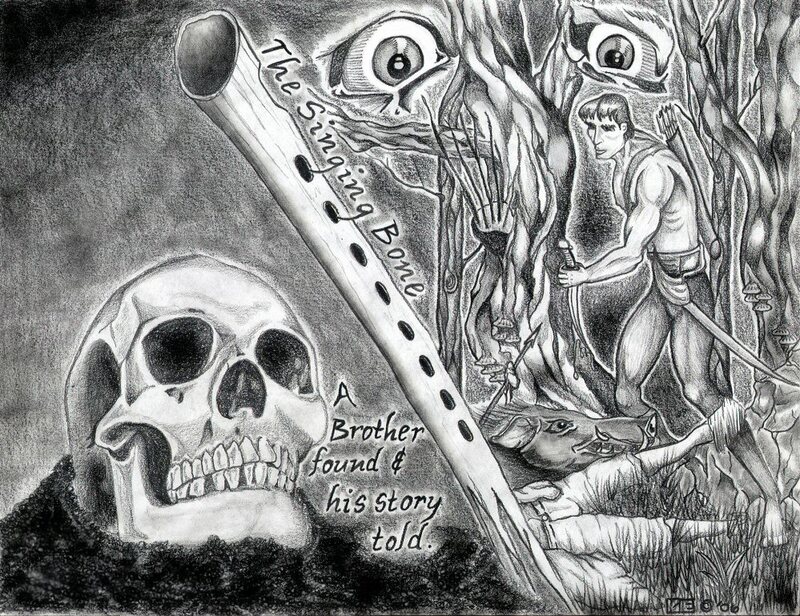 When his younger brother did not return he said, “The boar must have ripped him apart,” and every one believed it. But as nothing remains hidden from God, this black deed was also to come to light. You are blowing on my little bone. When he brought it before the king, the horn again began to sing its little song. The king understood it well, and had the earth beneath the bridge dug up. Then the whole skeleton of the murdered man came to light. The wicked brother could not deny the deed. He was sewn into a sack and drowned alive. The murdered man’s bones were laid to rest in a beautiful grave in the churchyard. This week’s artwork by projectGRIMM! For new fairy tale updates every Wednesday and Saturday, follow this blog! Today I got the first preliminary sketches for The Prince of Prophecy Vol. II: Cursed, and already my characters are looking fantastic! I can’t wait to see the end product! I’m considering contracting another couple of beta readers, so if anyone is interested in getting a free paperback book, please leave a comment below (that will probably begin in November). As for the sixth and final installment in the Prince of Prophecy series, I’m almost to the end (I’ve been saying that for about a month and a half now, I know). I hope to have the final book finished by the end of this month *crosses fingers*. Yeah, I know, It’s not all that different, but the text clouds aren’t so “in your face” anymore, which I like. For new Prince of Prophecy and fairy tale updates every Wednesday and Saturday, follow this blog!